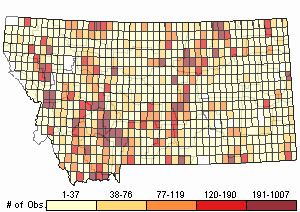 In the Bozeman area, normal migration periods are April 23 to May 20 and September 10 to 23 (Skaar 1969). In central Montana they nest on the ground under big sagebrush, but concealment of the nest is not greatly important (Best 1970). They are found in areas where vegetation was short and dense, with a high percentage of cover (Reed 1984). 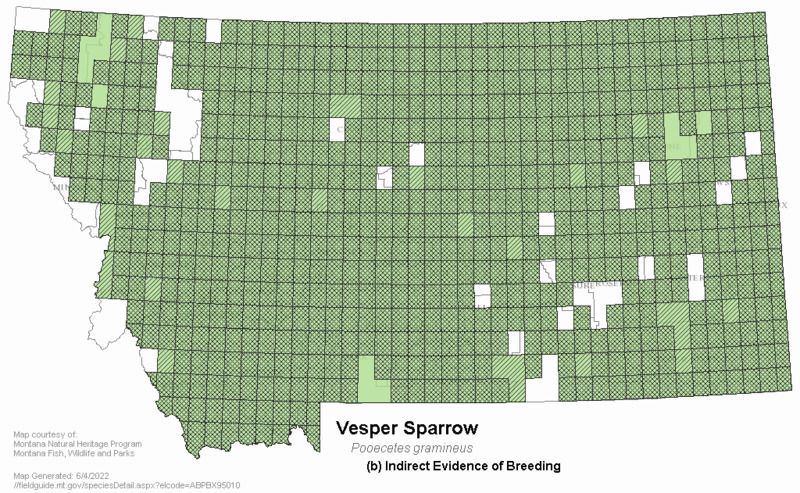 In central Montana, 70 to 90% of food was animal (mostly Coleopterans), while 3 to 23% was plant (mostly grass seeds) in areas grazed 2 years before and sprayed with chemicals (Best 1970). 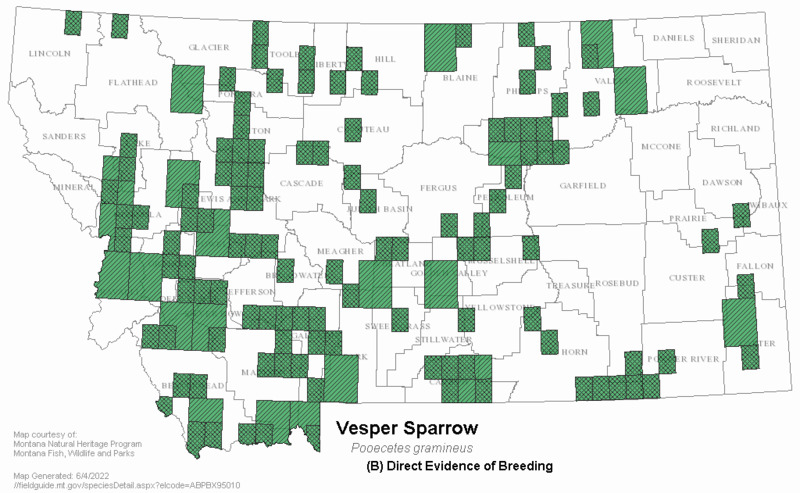 In central Montana, an average of 24 breeding pairs per 100 acres was found. Territories associated with the less preferred tall and patchy vegetation are larger than territories in preferred vegetation (Reed 1984). In central Montana, the average clutch size was 3.25. Near Fortine, full clutch dates range from May 30 to July 25. 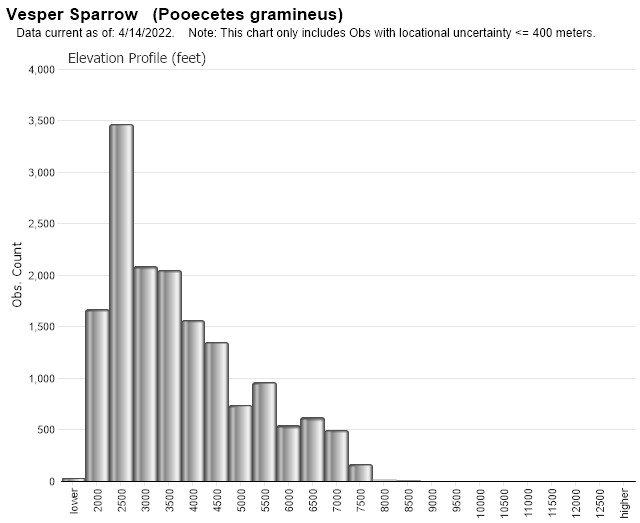 Statewide, nesting is from late May to late August (probably 2nd broods) (Davis 1961). Best, L.B. 1970. Effects of ecological changes induced by various sagebrush control techniques on non-game birds. M.S. thesis. Montana State University, Bozeman. 74pp. Reed, J.M. 1984. 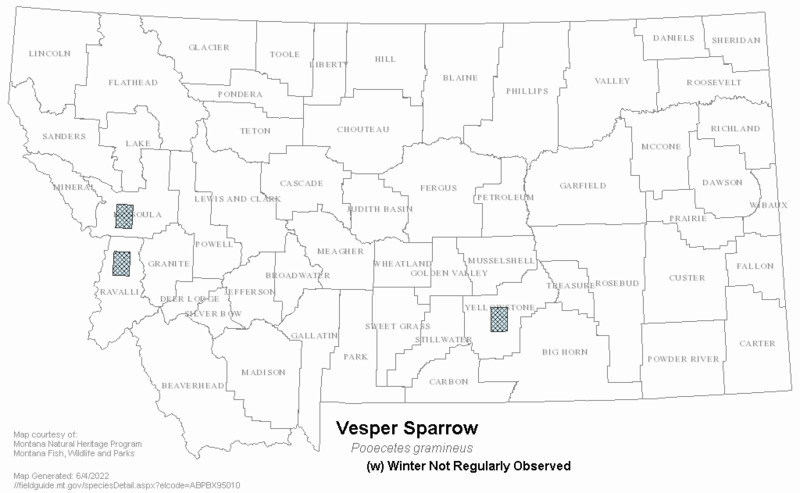 Habitat selection and territory size regulation in the vesper sparrow (Pooecetes gramineus). M.S. thesis. Univ. Montana, Missoula. 75 pp. Econ, Inc. (Ecological Consulting Service), Helena, MT., 1977, 1977 wildlife and wildlife habitat monitoring study, Peabody Coal Company Big Sky Mine. Proj. 161-85-A. November 30, 1977. Feist, F.G. 1968. 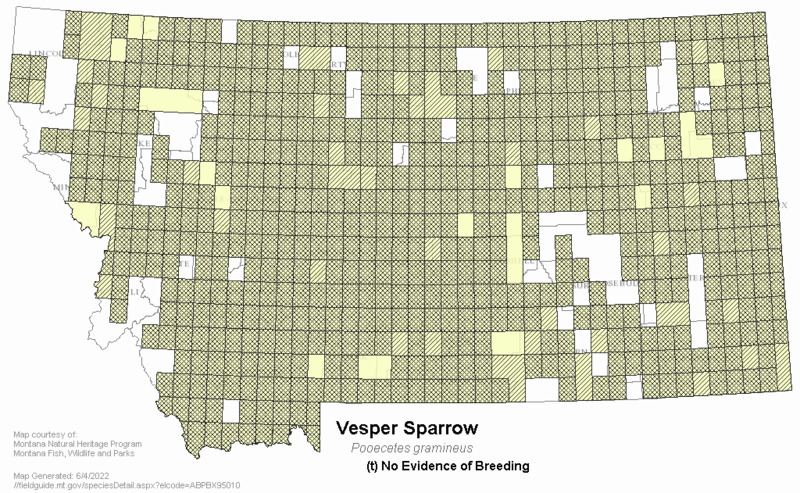 Breeding bird populations in relation to proposed sagebrush control in central Montana. M.S. Thesis, Montana State University, Bozeman, MT. 41 pp. Audubon Field Notes 22:691-695. Hand, R. L. 1969. 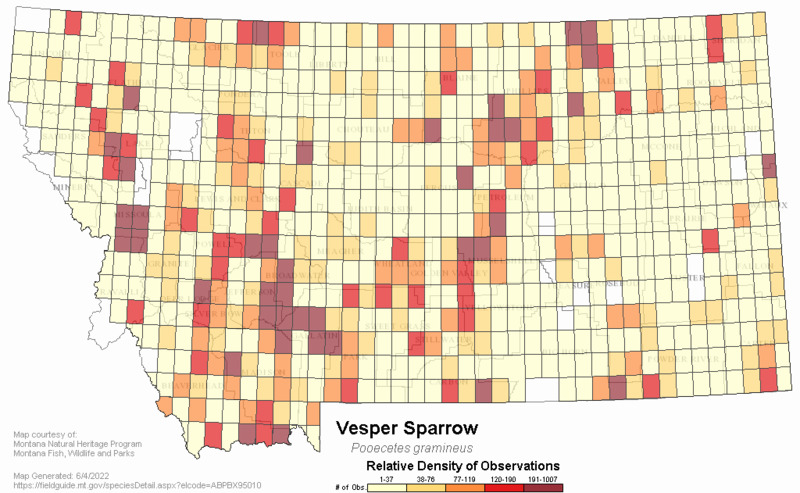 A distributional checklist of the birds of western Montana. Unpublished. Available at Mansfield Library, University of Montana, Missoula. Hejl, S.J. and R.E. Woods. 1991. 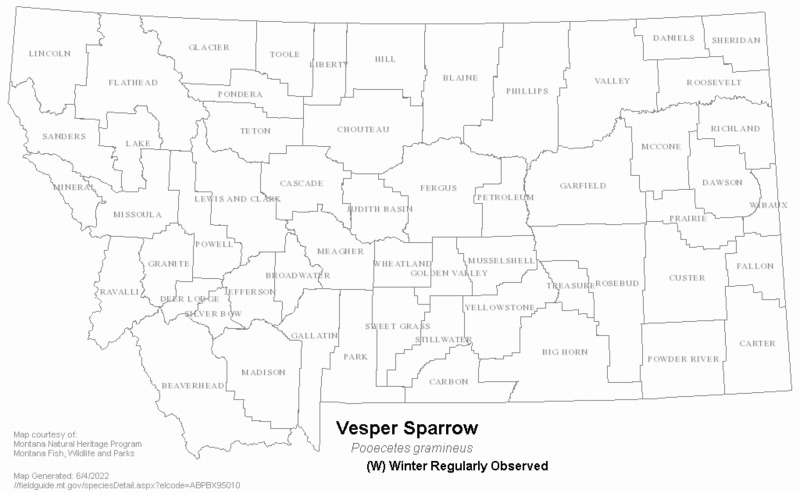 Bird assemblages in old-growth and rotation-aged Douglas-fir/ponderosa pine stands in the northern Rocky Mountains: a preliminary assessment. Pages 285-292 in D. M. Baumgartner and J. E. Lotan, eds. Symposium proceedings, interior Douglas-fir: the species and its management. Wash. State Univ., Pullman. Land & Water Consulting, Inc., Missoula, MT., 2002, Montana Dept. of Transportation Wetland Mitigation Monitoring Report, Year 2002: [Jack] Johnson - Valier, Montana. Proj. No. 130091.018. May 2003. In 2002 Wetland Mitigation Monitoring Reports, Vol. II. Land & Water Consulting, Inc., Missoula, MT., 2002, Montana Dept. 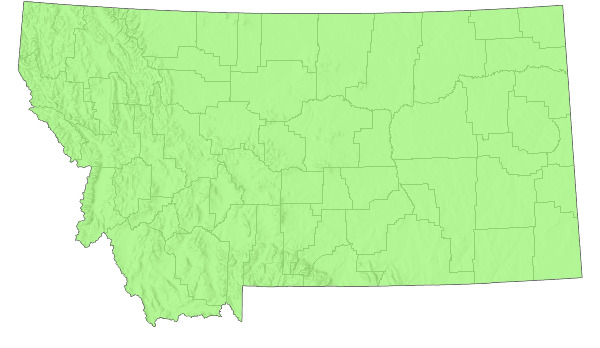 of Transportation Wetland Mitigation Monitoring Report, Year 2002: Beaverhead Gateway, Dillon, Montana. Proj. No. 130091.011. February 2003. In 2002 Wetland Mitigation Monitoring Reports, Vol. I. Land & Water Consulting, Inc., Missoula, MT., 2002, Montana Dept. of Transportation Wetland Mitigation Monitoring Report, Year 2002: Perry Ranch, Glacier Co., Montana. Proj. No. 130091.020. May 2003. In 2002 Wetland Mitigation Monitoring Reports, Vol. II. Pyrah, Duane, and Edward F. Schlatterer, 1968, Ecological effects of chemical and mechanical sagebrush control. Ecology of sagebrush control. W-105-R-2, A-1 and B-1 through B-10, July 1, 1966 through June 30, 1967. Sullivan, Daniel, 1982, Bait stations as a means of rodenticide presentation to control Columbian ground squirrrels. Technical Rep. 82-3. Sept. 1982. 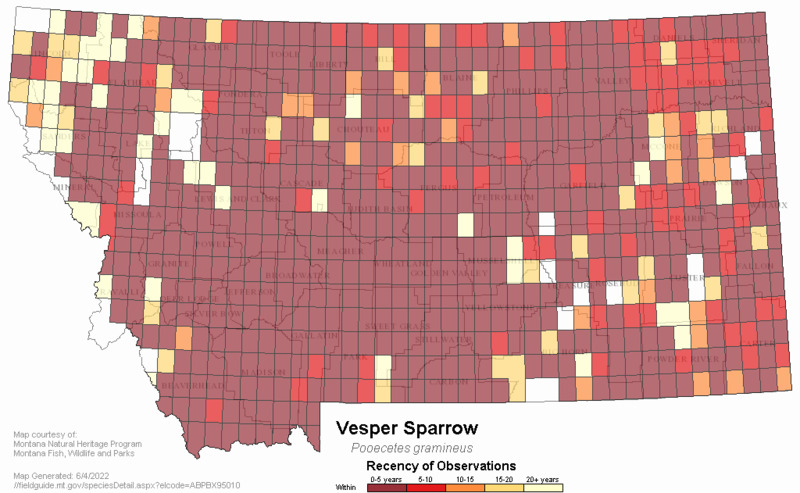 Web Search Engines for Articles on "Vesper Sparrow"